Galba Servius Sulpicius, Roman emperor from June, A.D. 68, to January, A.D. 69. He was born near Terracina, B.C. 3. Both Augustus and Tiberius are said to have told him thaht one day he would be at the head of the Roman world. Obverse: SER GALBA IMP CAESAR AVG P M TR P, laureate, left, globe at point of bust. 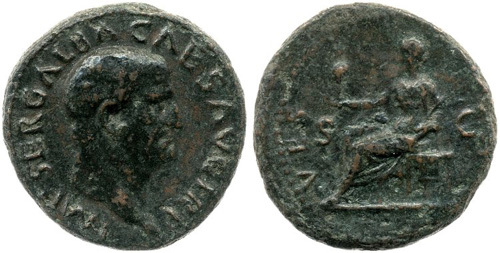 Reverse: DIVA AVGVSTA, S - C to left and right Female figure (Livia), draped, standing left, right holding patera, left long sceptre. Obverse: SER GALBA IMP CAESAR AVG P M TR P P P, laureate, right, globe at point of bust. Obverse: SER GALBA IMP AVGVSTVS, laureate, right, globe at point of bust. Reverse: LIBERTAS PVBLlCA, S - C to left and right Libertas, draped, standing left, right holding pileus, left vertical rod. Obverse: SER GALBA IMP AVGVSTVS, laureate, left, globe at point of bust. Reverse: QVADRAG ENS REMISSAE, S C (in exergue), Arch on right, surmounted by two equestrian statues to left; three captives, hands tied behind their backs, advance right below and towards arch, with an officer behind them. 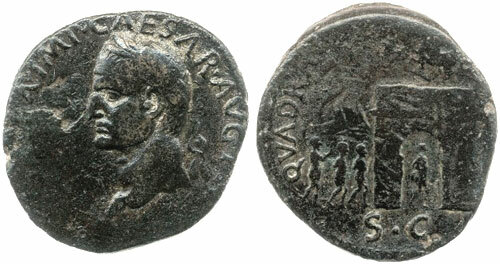 Reverse: QVADRAGENS VMA REMISSA, S C (in exergue), Arch on right, surmounted by two equestrian statues to left; three captives, hands tied behind their backs, advance right below and towards arch, with an officer behind them. Obverse: SER GALBA IMP CAESAR AVG PON M TR POT, Laureate, right, with globe at point of bust. 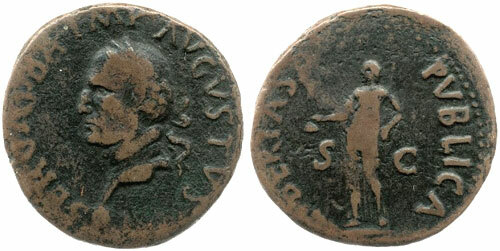 Reverse: ROMA (in exergue), S-C to left and right Roma, helmeted and in military dress, seated left on cuirass, right holding Victory, left resting on parazonium at side; behind her, two shields. 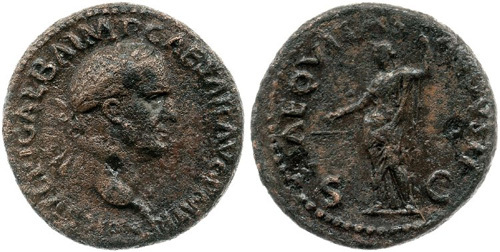 Obverse: IMP SER GALBA AVG TR P, Laureate, right. Reverse: CERES AVGVSTA S- C in exergue, Ceres, draped, seated left, right holding two corn-ears, left caduceus. Obverse: SER GALBA IMP CAES AVG TR P, Laureate, right. Reverse: LIBERT AVG, S - C to left and right Libertas, draped standing left, right holding pileus, left vertical rod. Reverse: S - C to left and right of aquila left on thunderbolt between two standards, all resting on bar. Reverse: S - C to left and right of aquila on facing prow between two standards on prows to left and right; all three prows ornamented with wreaths. 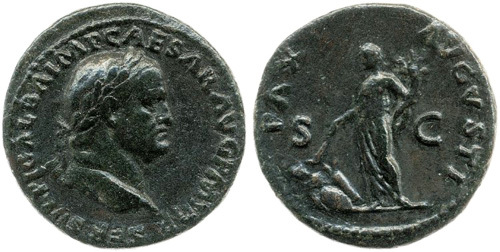 Reverse: VESTA in exergue, S - C to left and right Vesta, draped, seated left on low chair, right holding patera, left palladium. Obverse: SER GALBA IMP CAES AVG TR P, Laureate, draped, right. Obverse: IMP SER SVLP GALBA CAES AVG TR P, Laureate, right. Reverse: CERES AVGVSTA, S C in exergue, Ceres, draped, seated left, holding two corn-ears in right hand and caduceus in left hand. Obverse: IMP SER GALBA CAES AVG P M TR P, Bare, right. Reverse: LIBERTAS PVBLICA, S - C to left and right Libertas, draped, standing left, right holding pileus, left vertical rod. 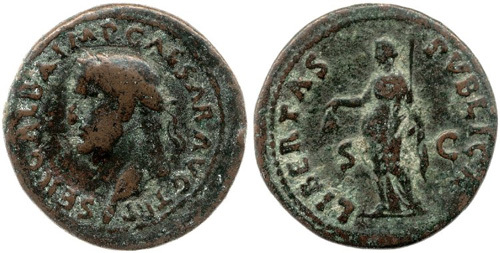 Obverse: IMP SER GALBA CAES AVG TR P, Bare, right. Reverse: VESTA, S - C to left and right Vesta, draped, seated left on low chair, right holding palladium, left transverse sceptre. 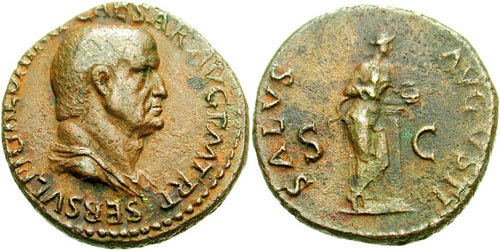 Reverse: VESTA in exergue, S - C to left and right Vesta, draped, seated left on low chair, right holding palladium, left transverse sceptre. Obverse: IMP SER GALBA CAESAR AVG TR P, Bare, right. Obverse: SER GALBA IMP CAESAR AVG TR P, Laureate, right. Reverse: CERES AVGVSTA, S C in exergue Ceres, draped, seated left, holding two corn-ears in right hand and torch in left hand. Obverse: SER GALBA IMP CAESAR AVG TR P, Laureate, left. Reverse: LIBERTAS PVBLICA, S - C to left and right Libertas, draped, standing left, holding pileus in right hand and vertical rod in left hand. Obverse: SER GALBA IMP AVG, Laureate, right, with globe at point of bust. 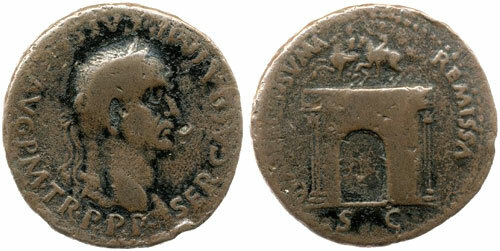 Obverse: SER SVLPI GALBA IMP CAESAR AVG TR P, Laureate, right. Reverse: AEQV-ITAS, S - C low to left and right Aequitas, draped, standing right, holding scales in right hand and vertical sceptre in left hand. Obverse: SER SVLPI GALBA IMP CAESAR AVG P M TR P, Laureate, right. Reverse: AEQVITAS AVGVSTI, S - C low to left and right Aequitas, draped, standing half-left, holding scales in right hand and vertical sceptre in left hand. Obverse: SER SVLPIC GALBA IMP CAESAR AVG P M TR P, Laureate, right. Reverse: PAXS AVGVSTI, S - C to left and right Pax, draped, standing half-left, holding cornucopia in left hand and setting fire to heap of arms on the ground with torch held in right hand. Obverse: SER SVLPI GALBA IMP CAESAR AVG P M TR P, Bare, draped, right. Reverse: SALVS AVGVSTI, S - C to left and right Salus, draped, standing right, legs crossed, leaning on column, feeding snake in her arms. Reverse: S - C to left and right Aquila between two standards, each set on ship's prow. Obverse: SER SVLPI GALBA IMP CAESAR AVG P M TR P, Laureate, right, with globe at point of bust. Reverse: S - C to left and right Victory alighting or stepping left, holding wreath in right hand and palm in left hand. 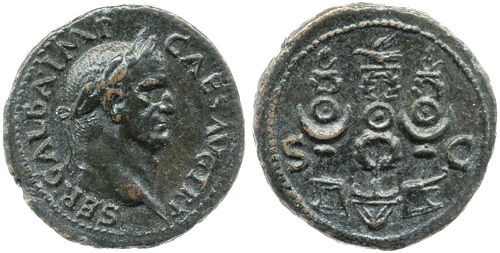 Obverse: SER SVLPI GALBA IMP CAESAR AVG P M TR P, Laureate and draped bust of Galba, right.